Montgomery County’s Laverock Hill Estate is again threatened with complete demolition in a new plan by Hansen Properties to redevelop the 42-acre site just north of Philadelphia. 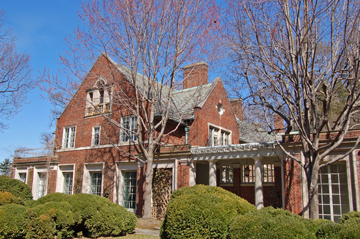 The property was featured on the Alliance’s 2010 Endangered Properties List after Hansen first proposed demolition plans, but these plans were tabled in order to pursue redevelopment options that would preserve the property’s Charles Platt-designed mansion, Horace Trumbauer-designed guesthouse, and Ellen Biddle Shipman-designed garden landscapes. Four years later, Hansen has submitted new concept plans to Springfield and Cheltenham Townships, proposing the complete demolition of the historic estate for 84 new single-family homes. Both townships approved these preliminary development plans at meetings on October 6 and 8, but the development will require amendments to both townships’ zoning ordinances for final approval. Check back here for updates on the proposal and how you can let public officials know the importance of preserving one of Montgomery County’s last intact estates. To learn more about the history and significance of the Laverock Hill Estate, CLICK HERE.